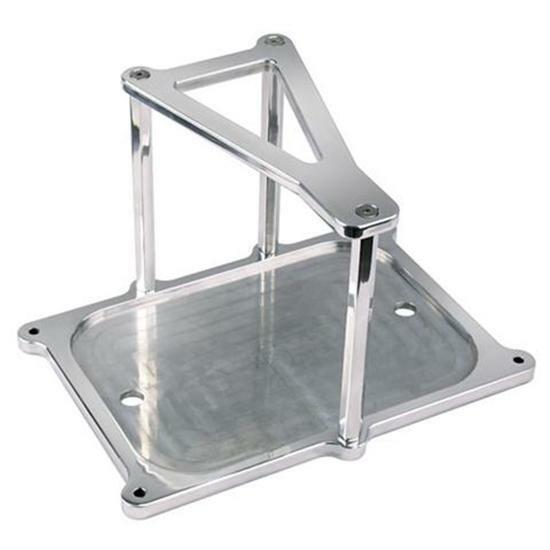 Polished Billet aluminum battery mount that is perfect for Optima batteries. Hold down is securely across the battery .Precision CNC machined for fit and has drain holes to prevent build up of moisture. 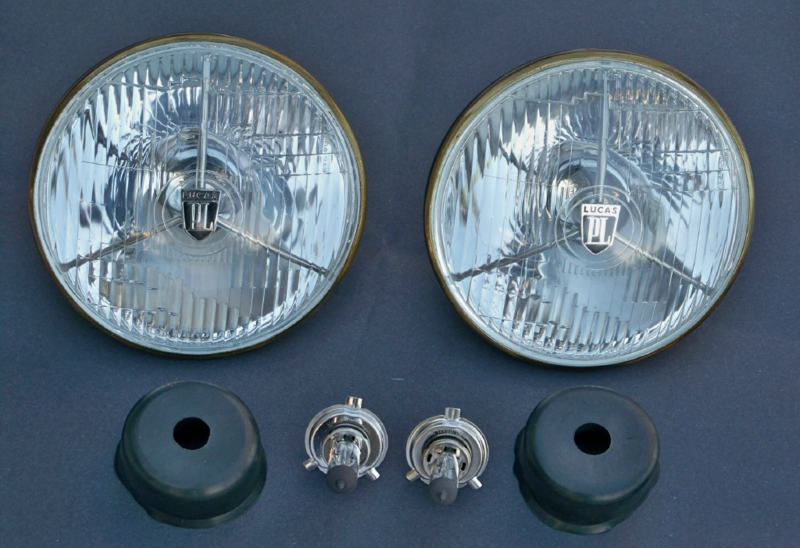 Pair of authentic 7 inch headlamps as supplied OEM to many of the classic 60s British sports cars. Made in England - includes sealed beam units,light retaining ring, chrome trim ring , rubber gaskets and hardware. buckets are rust proof. License plate light , chrome plated original design with rubber gasket.uses 2 bulbs. In the 50 and 60s this lamp could be found on many of the British sports cars such as Aston Martin .Jaguar and AC. A most popular '60s design includes rubber sealing gasket As fitted originally to many Cobras as an alternative to round lights. The dimensions are height 5 inches width 3 inches and depth 1 inch. Red lens with built in reflector ,uses twin filament bulb. Price is for a pair. Lucas tail /indicator / marker lamps Alternative lamp on the Roadsters - used also on the Coupe . Available in clear,amber or red. They are 3 inch diameter and 1.25 inch deep price is for a pair. Please state lens color when ordering. 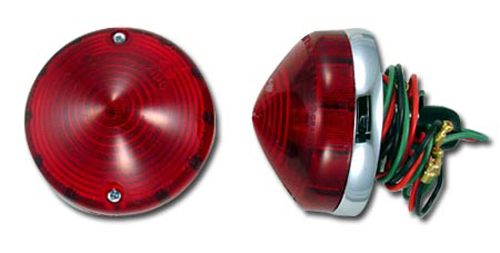 Lucas L692 round light price is for a PAIR, Used as marker (side) indicator and tail/brake lights ,also known as the "Healy style" Twin filament - dimensions are 3.25 inch (83mm) diameter 2.0 inch (51mm) deep. Lucas 3 position toggle (flick) switch . Used for indicator ,first position left turn ,center off, third position right turn. - The toggle is longer than the other switches and is mounted sideways for obvious reasons! Lucas part # S-31743. Lucas 3 position toggle (flick) switch . 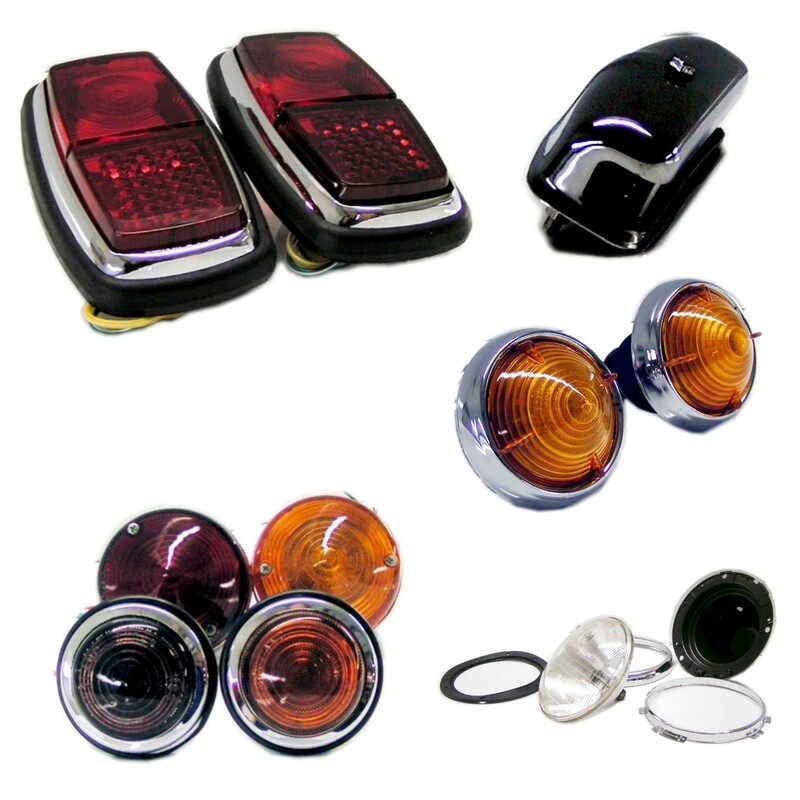 Used mainly for lights ,first position side (running) and tail lights ,second position also turns on the head lights. Can also be used on heaters with 2 speed blowers (fans)rated 20 amp - Lucas part # S-31788. Lucas 3 position toggle (flick) switch . Used exclusively for wipers can be used with two speed wiper motors and the wipers will self park when switched off.Rated 20 amp - Lucas part # S-35927. Lucas 2 position toggle (flick) switch .Used for headlights to change from high to dipped beam Lucas part # S34889 Rated 20 amp sold each . Used in conjunction with S 31788 this arrangement is an alternative to column or floor mounted dipper switches.